The world’s most creative and forward-thinking healthcare start-ups and SMEs have been taking part in the daily inaugural Innov8 Talks at Arab Health 2019. Thirty two companies from around the world have been invited to present their ideas to an esteemed panel of judges that are involved in driving innovation in the Middle East & North Africa (MENA) region, and will include the world’s only closed system for digital point-of-care urine testing – with the system launching at Arab Health – and Virtual Reality (VR) therapy for the home treatment of eye problems, amongst others. 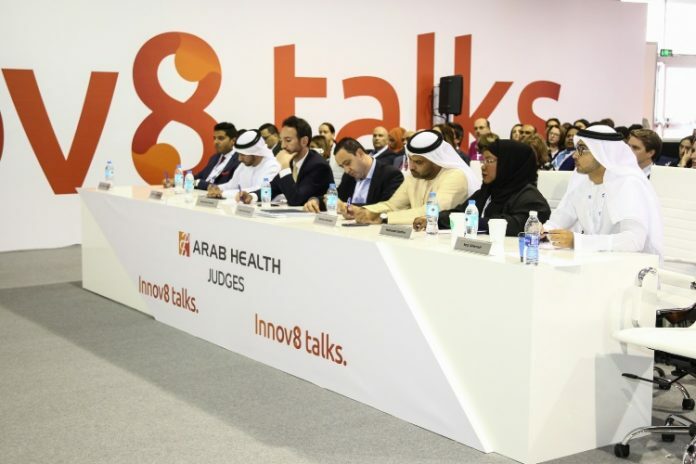 On each of the four days of Arab Health, which continues until 31st January at the Dubai World Trade Centre, eight companies have eight minutes to make their “pitch” for their healthcare innovation in a bid to be selected as a winning pitch and have a potential to shape the future of healthcare. MirambeauAppCare was one of the eight companies that participated in the Innov8 Talks pitch presentations today, showcasing its diabetes management application. DiabiLive is a multiplatform medical application for diabetic patients allowing them greater autonomy by calculating the exact needed insulin dose based on medical protocol, diet and physical activity. The panel of judges for Innov8 Talks pitch presentations include Dr Mohammad Al Redha, Director, The Executive Office for Organizational Transformation, Dubai Health Authority; Mohamed Hamdy, Head of Venture Capital, Dubai Future Foundation; Saqr AlHemeiri, Chief Innovation Officer, Ministry of Health and Prevention; Mubaraka Ibrahim, Director of IT Department, Ministry of Health and Prevention; Marwan Abdulaziz, Executive Director, Dubai Science Park; Daniel Amir Raduan, Head of Digital Health, Etisalat; as well as Akbar Moideen Thumbay, VP – Healthcare Division, Thumbay Group. In addition to the pitch presentations, each day of the Innov8 Talks is opened by a keynote speaker discussing topics ranging from genomics, Artificial Intelligence (AI) and the digital transformation of healthcare systems. During the afternoon sessions, the audience will hear from regional and international leaders in the field on how the latest healthcare innovations determined to enhance the delivery of care for patients. Organised by Informa Exhibitions – Healthcare, Arab Health 2019 will welcome more than 4,150 exhibiting companies from 66 countries and an anticipated 84,500+ attendees from across the globe. As well as providing a platform for the world’s leading manufacturers, wholesalers and distributors to meet the medical and scientific community in the Middle East, delegates can benefit from 11 business and Continuing Medical Education (CME) conferences as part of the Arab Health Congress.